I love the construction industry, and I speak from experience when telling you it has to be saved from itself. Since 1938, our family business has helped build the monuments of this city and this state. More important, our companies - like many others over the past 75 years - have helped tens of thousands of hard-working Americans enjoy an honorable blue-collar, middle-class standard of living. But, now our middle class is threatened like never before. When I graduated from Texas A&M University in 1969, after serving my active duty in the U.S. Marine Corps Reserves, I joined the local carpenters union as a drywall mechanic. Wages and benefits were very good and it was indeed a quality, middle-class occupation. The non-union tradespeople enjoyed the same kind of lifestyle. We all received good hourly pay, overtime, worker's compensation insurance protection and had employment taxes deducted and paid. There was a bond between company and worker. We worked hard to keep our jobs secure. If our company did well, we would be provided for. And, we were. Fast forward to today and my, how things have changed. 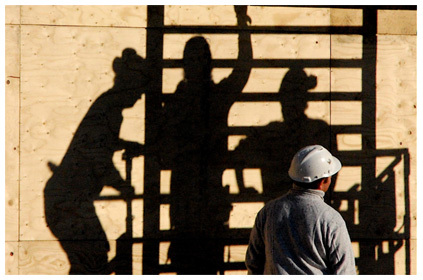 Many construction companies now look for ways to avoid having employees altogether. They don't want a bond between company and worker. The truth is they want as few strings as possible because having employees on the books means having to shell out for hourly pay, overtime, benefits, workers' comp, payroll taxes, compliance with employment laws and the possibility of being audited by the federal government to verify the immigration status of workers. In our industry, as in others, many companies "misclassify" their employees, which means they pretend their workers are "independent subcontractors" when by law they meet the definition of an employee. This practice allows those companies to get a pass on all the obligations of an employer, most of which protect the worker. Without employees, there are no minimum wage and overtime laws to abide by. There are no benefits like medical insurance, vacation and paid holidays. There is no workers' compensation insurance or jurisdiction from the Occupational Safety and Health Administration to protect the worker. Taxes on labor are not withheld and sent to our federal government. The unemployment trust fund in Texas is dwindling as a direct result. And now that the Affordable Care Act is the law of the land, its employer mandates give companies even more incentive to unload their workers into the underground economy. As taxpayers, we all suffer while the working man and woman take the brunt of it. A bipartisan Texas House Committee report recently said, "A misclassifying employer compromises free markets through unfair competition and promulgates lawlessness." The panel noted that the Texas Workforce Commission found more than 60,000 workers had been misclassified in 2013, resulting in $8.6 million in unpaid taxes. I believe those numbers are just the tip of the iceberg. Keep in mind that the Workforce Commission can only identify a portion of what's really happening because the agency has limited resources. It is already illegal to misclassify employees, but companies do it anyway because government enforcement and self-policing by the industry are sorely missing. The elephant in the room is that many of these same workers lack legal status. Most began working under a traditional employer-employee relationship. But as immigration enforcement actions, which came as workplace raids under President Bush and now audits of employee-eligibility verification forms (I-9s) under President Obama, removed them from the rolls of legitimate employers, they migrated to the independent-contractor model. You may think that when immigration audits identify illegal workers, they are then deported. That's not true at all. The employer is simply required to terminate them. It seems they are rarely deported in those circumstances. So, many end up working for unscrupulous employers who call them independent contractors knowing the workers are unlikely to seek legal recourse. Contractors who abide by the law cannot compete against those who use the independent-contractor business model. Those who cheat on their taxes in this fashion can underbid ethical contractors by as much as about 35 percent. While the cheaters get the contracts, middle-class jobs are falling by the wayside. There is no doubt the federal government, including lawmakers from both parties, has failed us so far on immigration reform and other underlying issues facing our shrinking middle class. But there is time to turn the corner. Government action, however, is not sufficient.